By stayhomecupcake on February 25th, 2013 . Filed under: Artwork, Birthday Ideas, Crafts, Cupcake Ideas . I love using a little clipart to brighten up my computer projects and what could be more perfect than cupcake clipart? 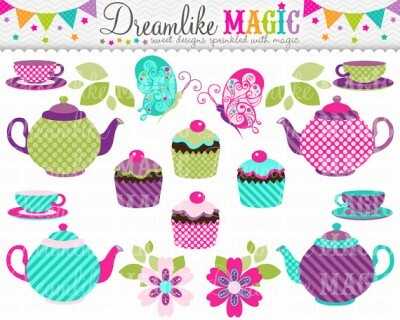 These totally sweet sets are available from Etsy seller, Dream Like Magic. 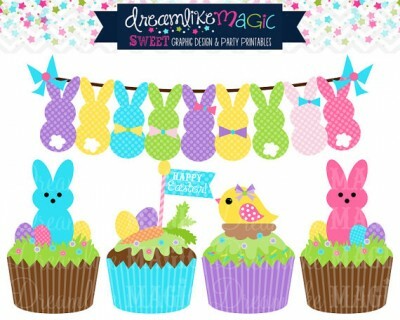 Their shop is filled with over 200 graphic designs sets to be used for cards, invitations, Facebook covers, scrapbooking, stickers and Etsy banners. I bought a banner from them a few years ago for my own Etsy shop (Stay Home Cupcake) and I could not be happier with it. The only problem now is that Dream Like Magic has so many new choices, I may have to buy an update!